The Mongols (Mongolian: Монголчууд, Mongolchuud) are an East-Central Asian ethnic group native to Mongolia and China's Inner Mongolia Autonomous Region. They also live as minorities in other regions of China (e.g. Xinjiang), as well as in Russia. Mongolian people belonging to the Buryat and Kalmyk subgroups live predominantly in the Russian federal subjects of Buryatia and Kalmykia. In various times Mongolic peoples have been equated with the Scythians, the Magog and the Tungusic peoples. Based on Chinese historical texts the ancestry of the Mongolic peoples can be traced back to the Donghu, a nomadic confederation occupying eastern Mongolia and Manchuria. The identity of the Xiongnu (Hünnü) is still debated today. Although some scholars maintain that they were proto-Mongols, they were more likely a multi-ethnic group of Mongolic and Turkic tribes. It has been suggested that the language of the Huns was related to the Hünnü. The destruction of Uyghur Khaganate by the Kirghiz resulted in the end of Turkic dominance in Mongolia. According to historians, Kirhgiz were not interested in assimilating newly acquired lands; instead, they controlled local tribes through various manaps (tribal leader). The Khitans occupied the areas vacated by the Turkic Uyghurs bringing them under their control. The Yenisei Kirghiz state was centered on Khakassia and they were expelled from Mongolia by the Khitans in 924. The Khitan fled west after their defeat by the Jurchens (later known as Manchu) and founded the Qara Khitai (1125–1218) in eastern Kazakhstan. In 1218, Genghis Khan destroyed the Qara Khitai after which the Khitan passed into obscurity. The modern-day minority of Mongolic-speaking Daurs in China are their direct descendants based on DNA evidence and other Khitans assimilated into the Mongols (Inner Mongols), Turkic peoples and Han Chinese. The Shiwei included a tribe called the Shiwei Menggu (Shivei Mongol). Bodonchar Munkhag the founder of the House of Borjigin and the ancestor of Genghis Khan is held to be descended from the Shiwei Menggu. The early Shiwei paid tribute to the Tuoba Wei (386–534) and submitted to the Khitans. After the Khitans left Mongolia the Khamag Mongols rose to prominence, when from the 1130s there were reciprocally hostile relations between the successive khans of the Khamag Mongol confederation (Khaidu, Khabul Khan and Ambaghai Khan) and the emperors of the Jurchen's Jin dynasty. The Jin dynasty fell after their defeat against the rising Mongol Empire, a steppe confederation that had formerly been a Jurchen vassal. Mongolic Khitans and Tuyuhuns or Monguor people (1227) came under rule of the Mongol Empire after conquest of the Western Xia and Jin Empires. The Qara Khitai submitted to Genghis Khan in 1218. With the expansion of the Mongol Empire, the Mongolic peoples settled over almost all Eurasia and carried on military campaigns from the Adriatic Sea to Indonesian Java island and from Japan to Palestine (Gaza). They simultaneously became Padishahs of Persia, Emperors of China, and Great Khans of Mongolia, and one became Sultan of Egypt (Al-Adil Kitbugha). The Mongolic peoples of the Golden Horde established themselves to govern Russia by 1240. By 1279, they conquered the Song dynasty and brought all of China under control of the Yuan dynasty. The Chahar's army was defeated in 1625 and 1628 by the Inner Mongol and Manchu armies due to Ligdan's faulty tactics. The Qing forces secured their control over Inner Mongolia by 1635, and the army of the last khan Ligdan moved to battle against Tibetan Gelugpa sect (Yellow Hat sect) forces. The Gelugpa forces supported the Manchus, while Ligdan supported Kagyu sect (Red Hat sect) of Tibetan Buddhism. Ligden died in 1634 on his way to Tibet. By 1636, most Inner Mongolian nobles had submitted to the Qing dynasty founded by the Manchus. Inner Mongolian Tengis noyan revolted against the Qing in the 1640s and the Khalkha battled to protect Sunud. About 200,000–250,000 Oirats migrated from Western Mongolia to Volga River in 1607 and established the Kalmyk Khanate.The Torghuts were led by their Tayishi, Höö Örlög. Russia was concerned about their attack but the Kalmyks became Russian ally and a treaty to protect Southern Russian border was signed between the Kalmyk Khanate and Russia.In 1724 the Kalmyks came under control of Russia. By the early 18th century, there were approximately 300–350,000 Kalmyks and 15,000,000 Russians. The Tsardom of Russia gradually chipped away at the autonomy of the Kalmyk Khanate. These policies, for instance, encouraged the establishment of Russian and German settlements on pastures the Kalmyks used to roam and feed their livestock. In addition, the Tsarist government imposed a council on the Kalmyk Khan, thereby diluting his authority, while continuing to expect the Kalmyk Khan to provide cavalry units to fight on behalf of Russia. The Russian Orthodox church, by contrast, pressured Buddhist Kalmyks to adopt Orthodoxy.In January 1771, approximately 200,000 (170,000) Kalmyks began the migration from their pastures on the left bank of the Volga River to Dzungaria (Western Mongolia), through the territories of their Bashkir and Kazakh enemies. The last Kalmyk khan Ubashi led the migration to restore Mongolian independence. Ubashi Khan sent his 30,000 cavalries to the Russo-Turkish War in 1768–1769 to gain weapon before the migration.The Empress Catherine the Great ordered the Russian army, Bashkirs and Kazakhs to exterminate all migrants and the Empress abolished the Kalmyk Khanate. The Kyrgyzs attacked them near Balkhash Lake. About 100,000–150,000 Kalmyks who settled on the west bank of the Volga River could not cross the river because the river did not freeze in the winter of 1771 and Catherine the Great executed influential nobles of them. After seven months of travel, only one-third (66,073) of the original group reached Dzungaria (Balkhash Lake, western border of the Qing Empire). The Qing Empire transmigrated the Kalmyks to five different areas to prevent their revolt and influential leaders of the Kalmyks died soon (killed by the Manchus). 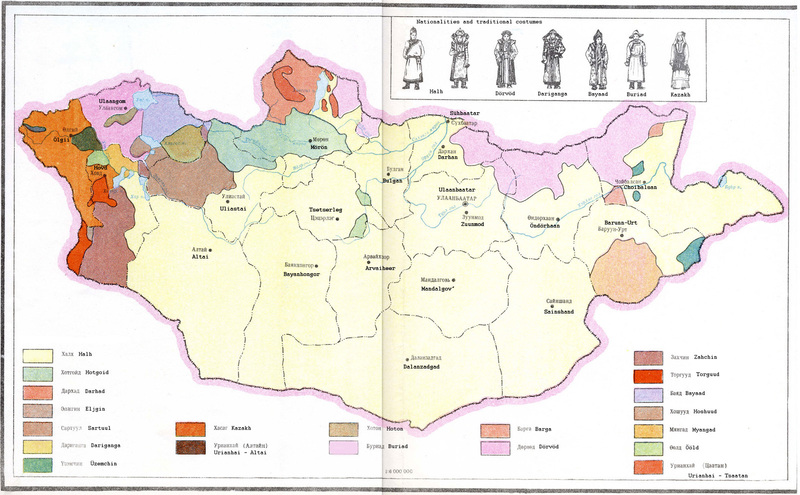 Russia states that Buryatia voluntarly merged with Russia in 1659 due to Mongolian oppression and the Kalmyks voluntarily accepted Russian rule in 1609 but only Georgia voluntarily accepted Russian rule. The Buryats started to migrate to Mongolia in the 1900s due to Russian oppression. Joseph Stalin's regime stopped the migration in 1930 and started a campaign of ethnic cleansing against newcomers and Mongolians. During the Stalinist repressions in Mongolia almost all adult Buryat men and 22–33,000 Mongols (3–5% of the total population; common citizens, monks, Pan-Mongolists, nationalists, patriots, hundreds military officers, nobles, intellectuals and elite people) were shot dead under Soviet orders. Some authors also offer much higher estimates, up to 100,000 victims. Around the late 1930s the Mongolian People's Republic had an overall population of about 700,000 to 900,000 people.By 1939, Soviet said "We repressed too many people, the population of Mongolia is only hundred thousands". Proportion of victims in relation to the population of the country is much higher than the corresponding figures of the Great Purge in the Soviet Union. On 22 January 1922 Mongolia proposed to migrate the Kalmyks during the Kalmykian Famine but Russia refused.71–72,000 (93,000? ; around half of the population) Kalmyks died during the famine. The Kalmyks revolted against Russia in 1926, 1930 and 1942–1943. In 1913, Nicholas II, king of Russia, said: "We need to prevent from Volga Tatars. But the Kalmyks are more dangerous than them because they are the Mongols so send them to war to reduce the population". On 23 April 1923 Joseph Stalin, communist leader of Russia, said: "We are carrying out wrong policy on the Kalmyks who related to the Mongols.Our policy is too peaceful". In March 1927, Soviet deported 20,000 Kalmyks to Siberia, tundra and Karelia.The Kalmyks founded sovereign Republic of Oirat-Kalmyk on 22 March 1930. The Oirat's state had a small army and 200 Kalmyk soldiers defeated 1,700 Soviet soldiers in Durvud province of Kalmykia but the Oirat's state destroyed by the Soviet Army in 1930. Kalmykian nationalists and Pan-Mongolists attempted to migrate Kalmyks to Mongolia in the 1920s.Mongolia suggested to migrate the Soviet Union's Mongols to Mongolia in the 1920s but Russia refused the suggest. Russia deported all Kalmyks to Siberia in 1943 and around half of (97–98,000) Kalmyk people deported to Siberia died before being allowed to return home in 1957. The government of the Soviet Union forbade teaching Kalmyk language during the deportation.The Kalmyks' main purpose was to migrate to Mongolia and many Kalmyks joined the German Army.Marshal Khorloogiin Choibalsan attempted to migrate the deportees to Mongolia and he met with them in Siberia during his visit to Russia. Under the Law of the Russian Federation of April 26, 1991 "On Rehabilitation of Exiled Peoples" repressions against Kalmyks and other peoples were qualified as an act of genocide. After the end of World War II, the Chinese Civil War resumed between the Chinese Nationalists (Kuomintang), led by Chiang Kai-shek, and the Chinese Communist Party, led by Mao Zedong. In December 1949, Chiang evacuated his government to Taiwan. Hundred thousands Inner Mongols were massacred during the Cultural Revolution in the 1960s and China forbade Mongol traditions, celebrities and teaching Mongolic languages during the revolution.In Inner Mongolia, some 790,000 people were persecuted. Approximately 1,000,000 Inner Mongols were killed during the 20th century. In 1960 Chinese newspaper wrote that "Han Chinese ethnic identity must be Chinese minorities ethnic identity".China carried out active propaganda war against Mongolia until the 1980s and the Chinese People's Liberation Army (PLA) carried out many raids into Mongolian border provinces during the 1960-1980s. China is carrying out "War of Map" against neighbouring countries since the 1950s. Agin-Buryat Okrug and Ust-Orda Buryat Okrugs merged with Irkutsk Oblast and Chita Oblast in 2008 despite Buryats' resistance. The Inner Mongols revolted against China in 2011. The Inner Mongolian People's Party is a member of the Unrepresented Nations and Peoples Organization and Inner Mongolian leaders are attempting to establish sovereign state or merge Inner Mongolia with Mongolia. The original religion of the Mongolic peoples was Shamanism. The Xianbei came in contact with Confucianism and Daoism but eventually adopted Buddhism.However, the Xianbeis in Mongolia and Rourans followed a Shamanism. In the 5th century the Buddhist monk Dharmapriya was proclaimed State Teacher of the Rouran Khaganate and given 3000 families and (some) Rouran nobles became Buddhists. In 511 the Rouran Douluofubadoufa Khan sent Hong Xuan to the Tuoba court with a pearl-encrusted statue of the Buddha as a gift. The Tuoba Xianbei and Khitans were mostly Buddhists, although they still retained their original Shamanism. The Tuoba had a "sacrificial castle" to the west of their capital where ceremonies to spirits took place. Wooden statues of the spirits were erected on top of this sacrificial castle. One ritual involved seven princes with milk offerings who ascended the stairs with 20 female shamans and offered prayers, sprinkling the statues with the sacred milk. The Khitan had their holiest shrine on Mount Muye where portraits of their earliest ancestor Qishou Khagan, his wife Kedun and eight sons were kept in two temples. Mongolic peoples were also exposed to Zoroastrianism, Manicheism, Nestorianism, Eastern Orthodoxy and Islam from the west. The Mongolic peoples, in particular the Borjigin, had their holiest shrine on Mount Burkhan Khaldun where their ancestor Börte Chono(Blue Wolf) and Goo Maral (Beautiful Doe) had given birth to them. Genghis Khan usually fasted, prayed and meditated on this mountain before his campaigns. As a young man he had thanked the mountain for saving his life and prayed at the foot of the mountain sprinkling offerings and bowing nine times to the east with his belt around his neck and his hat held at his chest. Genghis Khan kept a close watch on the Mongolic supreme shaman Kokochu Teb who sometimes conflicted with his authority. Later the imperial cult of Genghis Khan (centered on the eight white gers and nine white banners in Ordos) grew into a highly organized indigenous religion with scriptures in the Mongolian script. Indigenous moral precepts of the Mongolic peoples were enshrined in oral wisdom sayings (now collected in several volumes), the anda (blood-brother) system and ancient texts such as the Chinggis-un Bilig (Wisdom of Genghis) and Oyun Tulkhuur (Key of Intelligence). These moral precepts were expressed in poetic form and mainly involved truthfulness, fidelity, help in hardship, unity, self-control, fortitude, veneration of nature, veneration of the state and veneration of parents. In 1254 Möngke Khan organized a formal religious debate (in which William of Rubruck took part) between Christians, Muslims and Buddhists in Karakorum, a cosmopolitan city of many religions. The Mongolic Empire was known for its religious tolerance, but had a special leaning towards Buddhism and was sympathetic towards Christianity while still worshipping Tengri. The Mongolic leader Abaqa Khan sent a delegation of 13–16 to the Second Council of Lyon (1274), which created a great stir, particularly when their leader 'Zaganus' underwent a public baptism. Yahballaha III (1245–1317) and Rabban Bar Sauma (c. 1220–1294) were famous Mongolic Nestorian Christians. The Keraites in central Mongolia were Christian. The western Khanates, however, eventually adopted Islam (under Berke and Ghazan) and the Turkic languages (because of its commercial importance), although allegiance to the Great Khan and limited use of the Mongolic languages can be seen even in the 1330s. The Mongolic nobility during the Yuan dynasty studied Confucianism, built Confucian temples (including Beijing Confucius Temple) and translated Confucian works into Mongolic but mainly followed the Sakya school of Tibetan Buddhism under Phags-pa Lama. The general populace still practised Shamanism. Dongxiang and Bonan Mongols adopted Islam, as did Moghol-speaking peoples in Afghanistan. In the 1576 the Gelug school of Tibetan Buddhism became the state religion of the Mongolia. The Red Hat sect of Tibetan Buddhism coexisted with the Gelug Yellow Hat sect. Shamanism was absorbed into the state religion while being marginalized in its purer forms, later only surviving in far northern Mongolia. Monks were some of the leading intellectuals in Mongolia, responsible for much of the literature and art of the pre-modern period. Many Buddhist philosophical works lost in Tibet and elsewhere are preserved in older and purer form in Mongolian ancient texts (e.g. the Mongol Kanjur). Zanabazar (1635–1723), Zaya Pandita (1599–1662) and Danzanravjaa (1803–1856) are among the most famous Mongol holy men. The 4th Dalai Lama Yonten Gyatso (1589–1617), a Mongol himself, was the only non-Tibetan Dalai Lama.The name is a combination of the Mongolian word dalai meaning "ocean" and the Tibetan word (bla-ma) meaning "guru, teacher, mentor". Many Buryats became Orthodox Christians due to the Russian expansion. During the socialist period religion was officially banned, although it was practiced in clandestine circles. Today, a sizable proportion of Mongolic peoples are atheist or agnostic. In the most recent census in Mongolia, almost forty percent of the population reported as being atheist, while the majority religion was Tibetan Buddhism, with 53%. Having survived suppression by the Communists, Buddhism among the Eastern, Northern, Southern and Western Mongols is today primarily of the Gelugpa (Yellow Hat sect) school of Tibetan Buddhism. There is a strong shamanistic influence in the Gelugpa sect among the Mongols. The 2010 census of the People's Republic of China counted more than 7 million people of various Mongolic groups. It should be noted that the 1992 census of China counted only 3.6 million ethnic Mongols. The 2010 census counted roughly 5.8 million ethnic Mongols, 621,500 Dongxiangs, 289,565 Mongours, 132,000 Daurs, 20,074 Baoans, and 14,370 Yugurs. Most of them live in the Inner Mongolia Autonomous Region, followed by Liaoning. Small numbers can also be found in provinces near those two. In Russia, the largest Mongolic ethnic group are the Buryats of 2010 census of 461,410, with the sole other representative being the Kalmyks of 183,400 in 2010 census. ↑ Xin Tangshu 219. 6173. ↑ 26.0 26.1 Jerry Bentley, "Old World Encounters: Cross-Cultural Contacts and Exchange in Pre-Modern Times (New York: Oxford University Press, 1993), 136. ↑ Dr. Mark Levene, Southampton University, see "Areas where I can offer Postgraduate Supervision". Retrieved 2009-02-09. ↑ Jack Weatherford , Genghis Khan and the Making of the Modern World. (New York: Crown, 2004. ), 94. ↑ 84.0 84.1 Түмэдхүү, ӨМӨЗО-НЫ ХҮН АМЫН ХУВИРАЛТЫН ЗУРГИЙГ ҮЗЭЭД (Southern) Mongolian Liberal Union Party (Mongolian) Millions of Han Chinese registered as "Mongol" and "Manchu" according to Chinese policy since the 1980s.There is no enough information about Chinese ethnic minorities due to the government policy. ↑ 768,000 families in Mongolia (2013).